Kansas City, Missouri (CNN) - Elder William Walker slipped white booties over his black wing-tip shoes and instructed his guests to do the same as he led them into the newest Mormon temple in the world. This day was the first chance the public had to see inside the sacred space for the area’s 49,000 Mormons, and it was also one of the last. On May 6, when Thomas S. Monson, the head of the 14 million member Church of Jesus Christ of Latter-Day Saints, dedicates this temple, the doors will close forever to the public. The church said it expects as many as 100,000 visitors in Kansas City before the temple will be closed to the public. After that, only temple-recommended Mormons will be able to walk through the heavy wooden and stained-glass doors. “This is a sacred space, set apart place for only those who are devout followers of the faith,” Walker said. For Mormons, temples serve as places of contemplation, instruction and worship experiences, like weddings and posthumous baptisms. The 67-year-old Walker is the executive director of the Temple Department, and he is the point man for the church’s 137 temples. Walker is a top official in the LDS church as a member of the First Quorum of the Seventy and he reports directly to Monson. The Canadian-born hockey fanatic has been a lifelong member of the church. He graduated from Brigham Young University, served a Mormon mission to Japan and spent time in the private sector working in securities and investment banking before being called to serve the church full-time in 2002. Kansas City’s temple is the latest to open. The church has announced it will build 29 temples across five continents. Construction is under way in Paris and Rome, and temples are planned for Peru and South Africa. “We’re building temples where the church is grown and have a concentration of members,” he said. Outside the new Mormon temple in Kansas City, Missouri. Inside the temple the required first stop is the Recommend Desk. After the dedication, only Mormons who have a recommend card are able to enter and participate in worship. The personalized cards are given by local church leaders to adherents who profess to be living in accordance with church teachings. As he explained the process, Walker reached into his wallet, pushed his Utah driver’s license aside and pulled out his recommend card, which was endorsed by Monson, his bishop. Walker said his credit-card-sized recommend card, like all others, is only good for two years. CNN was invited by church officials to tour the temple with Walker before its dedication. The church denied CNN's request to film inside the space, saying it was against church policy. The LDS church provided still images after the tour, which accurately depicted key parts of the temple. In a rare move, CNN was permitted to film inside the front of the temple at the Recommend Desk, but no farther. "It's not about secret. It's about sacred,” Walker said after the tour, making what the church sees as a key distinction. “We feel that it's a very sacred and special place and therefore it is reserved for those worship functions and those ordinances that take place in the temple. It's not about secret." Walker said the policy is not unlike that for Shinto shrines in Japan, where he served his mission. But it's a thin line between sacred and secret. 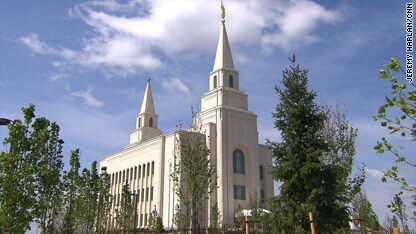 Public tours of the temple are only available when they are first built or undergo massive renovations. After that, outsiders and Mormons who are not temple recommended are kept out, even from wedding ceremonies. In the sealing room, where eternal weddings take place, Walker points out the altar at the center of the room. The bride and groom kneel facing each other and the officiant stands off to the side. The room is richly decorated with Swarovski crystal chandeliers and massive gilded mirrors on either side of the room, and Walker raves about the design on the white carpet, carefully explaining how local artisans cut the meticulous pattern by hand. Despite the grand size of the building, each room is small: This is the biggest of the three sealing rooms, and its capacity is just 49 people. The temple also contains a gleaming baptismal font. Though it’s a point of pride for Mormons, it has been controversial elsewhere. A church ceremony called “proxy baptisms” by Mormons includes posthumous baptisms of Jews, some of whom have protested the practice. 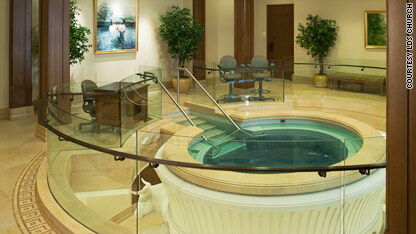 The baptismal font at the newest Mormon temple. However, in Mormon doctrine, baptism is essential for salvation. While converts to the faith are baptized in services at local wards, the weekly meeting place for services open to the public, proxy baptisms take place only in the temple and in private. The proxy baptisms are supposed to be for Mormons’ ancestors who were not of the faith. Walker said the baptism serves as an invitation to accept Mormonism as an avenue into heaven. At the temple, Walker took his visitors through the process as it is supposed to work. The font rests on 12 oxen, which he said represent the tribes of Israel. Adherents change into white gowns he jokingly referred to as "jumpsuits," provided by the temple. A male priest leads the proxy into the waist-high water, gives the blessing and the name of the ancestor, then the proxy is lowered into the water, fully immersed, then brought up to the surface. The desk next to the font has a small monitor and a light. That person's job is to record the act for the church's central database. But some Mormons have used the church’s extensive genealogy database to baptize others who are not Mormon ancestors, such as the murdered Jewish reporter Daniel Pearl and holocaust victims like Anne Frank. It’s a practice that has outraged Jewish leaders. “We’re sorry. We live by our word and when we say we’re going to do something, we’re going to try and do it,” Walker said. He acknowledges interest in proxy baptisms, and other Mormon practices, has spiked thanks to Mormon Mitt Romney’s run for president. While the church takes no position on party politics nor allows its officials to endorse candidates, Walker can see some good coming out of Romney's run for the White House. « Previous entrySacred Spaces: Arabic Christians find a home in the U.S.
Eco travel is the first choice for travel. For many years Eco Travel has been serving the needs of each and every customer who looks for vacation. Acclaimed by Astute Travelers as one of the Top Ten Travel & Tour websites that can save you money on air tickets, hotels, auto rentals and other travel expenses. Change of passenger names is not permitted. Changes or cancellation of flights are not permitted. Charges may appear on your credit card under the name. Our Cheap Tours services areas are USA, Europe, Asia, China, Australia etc. If you want to know more than visit our site or Contact Us: Address: 675 Cochrane Dr.; East Tower; 6th Floor; Markham; L3R0B8. Tel: 905.660.7999 / 416.630.1999. Christians, take note. This is exactly what your cult looked like to the world 150 years after its founding. heard him talk about black people in the church) he said that he didnt realize they had such big hands. Ive heard him talk about women in ways that would make most men cringe. He hasnt said a loving or genuine thing to me since re-joining the church. Except once. He has alienated all four of his children who are not Mormon and see the changes he has undergone. I have to tell you, it is very odd to see such behavior in light of the claims to behavior that I assume is pronounced within church walls. SCARY. VERY VERY SCARY for a daughter and the rest of the non-Mormon family. What I would like to see is a genuine acceptance of the true equality of all humans, and a love and happiness that radiates throughout him. Rather, he comes across as an angry, abusive and aging person who is not happy about where his life has gone and vents those things onto other people and groups that are safer for him to do so. And he continues to do so thru stories I hear about- in leadership in the church as "State ward President" I want him to be happy and kind and loving. He could exhibit those traits before he converted. Now I see him as fearful and weak in his abilities to lead a balanced emotional life. Danielle, I'm sorry your father was such a poor example of what a Christian person should be to you. I am a member of the LDS faith and I can tell you that most people I know in the faith do not espouse the views your father expressed about people of other faiths and races. There are going to always be people who express such views in all walks of life, but in no way does our church condone or teach such views. I know it is hard to believe what I am saying because you experienced this from someone who was so close to you, but I hope you will look a little farther into the matter and see if what I am saying is true. Lol @ Danielle. Your father is quite a character. If you attribute this one man's behavior to all of Mormons then you are out of touch with reality. As long as humans are imperfect and exercise free will there will always be people like your father. I thought this went without saying... You might want to broaden your horizons a bit. What a beautiful place to worship the LORD. Oh well, can't stop white trash from being trash.